Azure Demoiselle (Chrysiptera hemicyanea) spawning in the branches of an SPS coral. The "main event" is from the beginning of the video until 1:16 then at 3:01 on the spawning seems to finish. After 1:16, the video moves onto other aquarium inhabitants. It is interesting that there are other damsels in the tank including a Black Ocellaris pair, a Ocellaris Clownfish pair and another black and white damselfish showing little to no aggression toward each other. You also see Banggai Cardinalfish, which also readily spawn in captivity. Seems this tank was well thought out! Back to the main event at 3:01, and you see the Azure Demoiselle couple continuing their activity among the SPS coral. Colorful and sprightly, Damselfish are quite hardy and adapt easily to the aquarium! Many Damsels are brilliantly colored fish. Most tend to stay small, under 3.9 inches (19 cm), making them suitable for smaller aquariums. They are not fussy about eating and some get along fine with other fish and invertebrates. They are also very durable and relatively inexpensive. These great characteristics make Damsels very popular aquarium fish. They are a common choice for beginners and are often used to "break-in" new aquariums to establish the nitrification cycle. It takes about one fish for every 10 gallons of water to do this. From the outset, however, it's important to understand that this is a very large group of fish that belong to the Pomacentridae family, and some of these wonderful qualities are not always the case with each species. Many damselfish may display spectacular colors, making them highly desirable additions to the tank. Yet not all of them exhibit attractive colors throughout their lives. Some that are quite attractive as juveniles become very unspectacular, even drab, as adults. Though quite a few tend to stay around two to three inches, there are some that can get quite large, like the Garibaldi that is said to reach up to 15 inches (38 cm) in length. Despite their overall popularity, different species also have distinctive behaviors and social traits. Some have bad reputations, and deservedly so, as little terrors that are dominating the tank! Though some species make good additions to most aquariums, there are many of these fish can be absolutely nasty towards their tankmates. Many of the Damselfish species belong to the subfamily Pomacentrinae and these fish can be quite aggressive. They are known to be territorial and aggressive, even towards other damsels. They are best keep as a single fish unless the tank has many hiding places or is larger than 50 gallons. Their companion tankmates also need to have a more aggressive nature. Yet other species that belong to the subfamily Chrominae, in the genus Chromis, tend to be more docile. Chromis fit the "first fish" niche very nicely. They are about as hardy as their cousins, but being a fairly non-aggressive damsel, they can be kept in a group and with more peaceful tankmates. The popular Clownfish, or Anemonefish, also belong to the Pomacentridae family and are members of the subfamily Amphiprioninae. The list of saltwater Damselfish below includes many aquarium species. These fish guides will provide you with the tools to better understand each species available to help you choose intelligently for your particular aquarium. Each guide has in-depth information with their places of origin, habitats, and behaviors. They also include the fish care needed for successfully keeping them in saltwater aquariums. Pictures are also provided with each guide to help with fish identification. Hypsypops genus contains a single species, the Garibaldi Hypsypops rubicundus. The Garibaldi or Garibaldi Damselfish Hypsypops rubicundus is the only member of this genus. Almost all of the Damsels are marine fish, though a few species inhabit the lower stretches of rivers in brackish lagoons and fresh water mangrove swamps. They are found primarily in tropical and temperate waters of the Indian and Pacific Oceans, but some species are found in the Atlantic Ocean and Caribbean Sea as well. While damsels are most abundant in shallow reef environments between 6 1/2 to 49 feet (2-15 m) deep, they can be found in a wide variety of habitats. They are found in sandy sheltered lagoons and tidal creeks to steep reef slopes and drop-offs. A few even live in deep-water habitats at depths below 328 feet (100 m). While many live in rocky areas, others will school in the water column, and still others live in sea-grass beds. Damselfishes have been thought to be very closely related to freshwater Cichlids. In fact they are similar in their general appearance and behavior. Like Cichlids, they have a one nostril on each side of the head and a small mouth at the end of the head. They have a laterally compressed body with relatively large scales that extend onto the fins and a long, continuous dorsal fin. Their coloration can be quite variable. Some are brilliantly colored while others are very drab. The juveniles of some genera are much more colorful than the adults, while in others there is very little difference between young and old. Most Damsels are relatively small, less than 3.9 inches (19 cm), but there are some that can get quite large. The smallest species is probably the Lined Chromis Chromis lineate from the Indo-Pacific, at around 2,75 (7 cm) long. The largest, found in the subtropical part of the Eastern Pacific Ocean, is thought to be the Garibaldi damselfish Hypsypops rubicundus, reaching up to 15 inches (38 cm). Their lifespan is an estimated 6 to 8 years in the wild, though some species may live 10 to 12 years in their natural habitats. In captivity they may live 18 to 20 years. These fish are members of the Pomacentridae family of Damselfish and Anemonefish. which contain around 360 species in about 29 genera. The family is divided into four subfamilies: Amphiprioninae, Chrominae, Lepidozyginae, and Pomacentrinae. The Anemonefish, more commonly known as the popular <a href="/encyclo/marine/clowns/clowns.php">Clownfish</a>, are members of the subfamily Amphiprioninae currently with 30 described species. The fish in the Pomacentridae family, with the exception of the Clownfish, are referred to as Damselfish or Damsels. The majority of Damselfish species belong to the subfamily Pomacentrinae with over 200 recognized species, followed by the subfamily Chrominae with over 100. The Subfamily Lepidozyginae currently contains only a single recognized species, the Fusilier Damselfish Lepidozygus anthioides. Damselfish are omnivores, yet for many the diet is largely herbivorous. In the wild many species will tend “gardens” of filamentous algae and may also eat tiny invertebrates. Some species also feed on heavily on zooplankton from the water column. They are not fussy eaters in the aquarium and they will normally accept all sorts of different foods. An important part of their diet is algae, though the amount of plant matter varies from one species to another. Good staple foods include a nutrient-rich vegetable flake, frozen foods for herbivores, frozen foods such as mysid shrimp and blood worms, and chopped frozen or fresh sea foods such as fish, clam, and squid meat. Most of them will nibble at some of the unwanted algae that grow on rocks and decor too. A varied and well balanced diet will keep them happy and healthy in the aquarium. 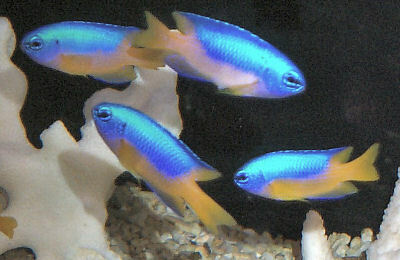 Damsels are very popular aquarium fish. Many have bright colors and are small in size, usually reaching only 2 to 3 inches. They are also extremely hardy. A single fish can be kept in a moderate sized aquarium, 10 or 20 gallons and thrive. These qualities make them a common choice for beginners and newly set up aquariums. Many damselfish, however, are very aggressive towards other fish if kept in a space that is too. In the wild, many species will stake out and aggressively defend territories on shelter patches of reef where they can hide, feed, and spawn. T hose that belong to the subfamily Pomacentrinae can be aggressive in the aquarium, especially if there is not adequate space with plenty of hiding places. Unfortunately the more aggressive species can attack other damsels, especially if you keep older specimens, as well as other fish. Ideally only one damsel should be kept unless the tank is large or has plenty of rocks and decor for hiding. Even mixing species is not suggested in smaller tanks. Other tankmates need to have a more aggressive nature, as passive fish will be harassed. There are a exceptions, however, that are much more docile damselfish. these damsels will get along well with other individuals of the same species, as well as with other species of fish. Those species that belong to the subfamily Chrominae in the Chromis genera are much less aggressive. These Damsels are just about as hardy as their close relatives, but are more of a schooling fish. They need to be kept in groups of at least five individuals to be happy, and will swim in a school in larger tanks, mostly in the upper portions of the tank. They can also be kept with more passive tankmates. Almost all damsels will leave invertebrates and other non-fish life alone. However there are some species that will snack on tiny worms and crustaceans. So be careful adding damsels to a tank where these little housekeepers are beneficial to the tank.